Frogspawn is an aggressive yet soft coral, making its beauty a bit difficult to bring into our tank. With the right tank mates, spacing and knowledge we can easily grow frogspawn coral. What Does It Take To Grow Frogspawn Coral? Again frogspawn are soft yet difficult to care for corals, and their lighting situation is no different. When choosing your lights you will want Medium to High strength lights. If you are going on the high end, which typically promotes coral growth, you will need to have your lights diffused. It should also be noted that direct metal halides can cause some serious damage and stunted growth to frogspawn coral. This being said it should be noted frogspawn coral likes high, but not too intense lights. 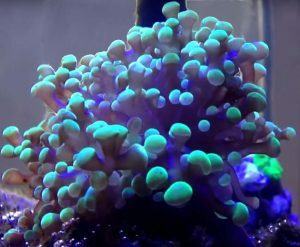 The best coral growth lights nowadays are LED fixtures that make better use of our wattage than metal halides and fluorescent bulbs ever did. Keep in mind the par your specific light gives at certain depths and adjust your frogspawn corals position accordingly. frogspawn coral does best in medium flow areas. This allows their tentacles to move freely, finding nutrients in the water. This also allows the dangerous sweeper tentacles to extend fully. More on this later. The position of your frogspawn coral will be highly dependent on your lights and water flow. If you have medium strength lights the frogspawn coral will do better higher in the tank. However you must keep it out of both direct water flow and dead zones for the best results. When placing the coral you will want the tentacles to bob in the current gently. Avoid the tree in a storm look as well as frozen in place due to no flow. Many of the needed nutrients can be added via dosing. The temperature and salinity are fairly common, so their should be no worries here. Strontium may be a new word to some of you, but it is essential to all corals who have a calcium carbonate skeleton. Strontium helps frogspawn coral both build its skeleton and rid itself of harmful toxins, so try not to neglect it. Calcium and Magnesium are somewhat hand in hand, as high magnesium levels will allow for lower calcium levels. In other words if your calcium levels are low, check your magnesium levels first. If they are high, say 1400, and your calcium is low, 380, you should not dose any more calcium. Calcium, magnesium and strontium are all used when building frogspawn skeleton. However having the levels too high will harm the coral and make it either hide or wither and die. Never over dose your corals. Alkalinity determines how much bicarbonate is available in the water for corals. These are used to secrete their calcium carbonate skeletons and therefore grow your frogspawn coral. Additionally alkalinity helps prevent pH swings. This may lead you to think higher levels are better, but without going too much into detail I’ll simply tell you that too high will slow your corals growth. Additionally high alkalinity levels can drive down the calcium level in your tank, leading to a never ending battle of dosing both. For these reasons it is best to keep alkalinity between 9-10dKh and calcium at 400-450 ppm. With their aggressive nature it should be no surprise that frogspawn coral needs plenty of feeding. Mysis and brine shrimp make excellent food choices while other aquarists choose to feed their corals diced fish or shrimp. The best practice here is to rotate foods to ensure the frogspawn coral gets all the nutrients is needs. When using tiny foods such as thawed mysis shrimp cubes it is easiest to use a turkey baster for spot feeding. Simply spray small amounts of food directly on the frogspawn corals head. You will notice the tentacles scrunch a bit around the food. Feeding is absolutely essential to frogspawn coral growth. Keep in mind that feeding corals will make your tank far dirtier than usual. Frequent water changes, such as 5% a week, will combat this issue while also reintroducing many needed additives to the water. Growth rate will largely depend on your specific frogspawn. Those with dense skeletons take a lot longer to develop their bodies, where as less dense strands can grow over 30 heads a year when properly cared for. If your main desire is to make money you should look for these fast growers. The slow, more dense frogspawn growth rate tends to be under half of the less dense strands. Still with the proper care and water conditions they can see 10 new heads per year. One of the earliest signs of growth is increased size of the existing heads. After they have expanded the coral tends to start forming new heads. This means you wont see any splitting right away. Remember the coral needs skeleton to spread onto. If you cover the entire skeleton or crowd it with rocks frogspawn will take much longer to grow. Once your coral has grown large enough you will need to frag it and either sell it, dispose of it or my favorite reposition it and start a second colony. To frag frogspawn coral you will need to cut or break the skeleton below the flesh of the coral. This gives the coral a nice base that can be glued to new rocks without damaging the corals tissue. You can frag frogspawn coral as long as it has two heads with no connecting tissue. Cutting the tissue for premature frags runs a high risk of coral loss and should be avoided. Due to their soft nature, frogspawn coral has many threats you will need to be on the lookout for. Some are even introduced by the aquarist themselves! These little guys are the cure for aptasia, a harmful pest that can sting corals and when large enough even hunt our fish! However once the peppermint shrimp have finished off the aptasia they will need a different food source. Most shrimp will turn to scavenging rocks, cleaning fish or rummaging through the sand bed. Peppermint shrimp however will often set their sights on soft corals. Frogspawn corals unfortunately fall under this category. If you have peppermint shrimp in the same tank as your frogspawn without any aptasia I highly advise removing them. This is a devastating disease that affects many lps corals. It pretty much spells the end for the entire head of coral and will spread rapidly if nothing is done. Unless absolutely all of your coral has brown jelly it is best to cut off the heads that have brown jelly and remove them. After doing so dip all of your remaining corals in an iodine dip. My recommendation is the Seachem reef dip sold on amazon. This disease cannot be taken seriously enough. Colonies that have brown jelly disease will often die within a day. Click here to read more about brown jelly disease. This is a simple problem that is caused by massive changes to the tank. Increased lighting, temperature swings, ultraviolet radiation, excessive flow and massive changes in salinity are all major culprits. Remember to adjust your tank gradually to avoid coral bleaching.